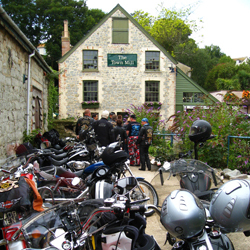 Demand for the Devon & Dartmoor Ride proved high, with 17 riders and 14 bikes taking part but 5 other enquiries had to be turned away due to accommodation constraints. All of the riders from the Vosges Ride (1-5 July) came back for more and it was good to team up with them again, together with new faces and old friends. The full ride complement was Rudi von Vollmar, Del Boy (Steve Hawkins), Buzz Lightyear (Charles Lewis), Dietmar Assimis-Kohls, “Grizzly” and Sue, Clive and Janis Rees, Chris and Ruth Smith, Howard Jones and Marjorie Webster, Paul Fulwood, “Don” Pierre Nicoli, Michael Melichar, Marius Bekker and yours truly. Unfortunately, pressures of work forced Simon Peacock to pull out a couple of days beforehand. A 09:00(ish) start from Warrs on Friday 31 July saw all except Grizzly and Sue, Buzz, Marius and Del Boy set out for our first stop, Wisborough Green, where we would join up with Grizzly and Sue. Buzz and Marius were scheduled to join us later down in Devon. As for Del Boy, well a frantic telephone call at 08:20 furnished the explanation that he had only just awoken... heavy night before... must have slept through his alarm call... best aim for a rendezvous at Wisborough Green... jabber, jabber, my Old Man’s a teapot. Next, he’ll be trying to get out of paying his Mess bill! Anyhow, there he was with Grizzly and Sue at Wisborough Green, ready for the rigours of the day. 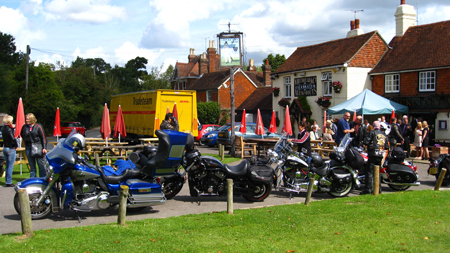 With the weather just about perfect for riding, we left Wisborough Green westwards along the A272 through Midhurst and Petersfield to our lunch stop at the Seven Stars in Stroud. So far, so good; timings working pretty well. A lazy ride across scenic Wiltshire countryside took us past the Wallops (Nether, Middle and Over) to join the A303 at Shepton Billinger and our first fuel stop just before Stonehenge. The dreadful A303 was at a standstill with the summer traffic, so some judicious filtering (not easy with 12 bikes) saw us safely to Stonehenge for ice cream, enrolment in some obscure Druid sect (don’t call me Del Boy, call me “Olwydd”) and a regulation coffee. Onwards down the A30 through Shaftesbury, Yeovil and Chard to join the M5 at Exeter Airport for the last dash down the motorway and A38. By this time, the perfect weather of earlier had given way to grey skies and moisture. 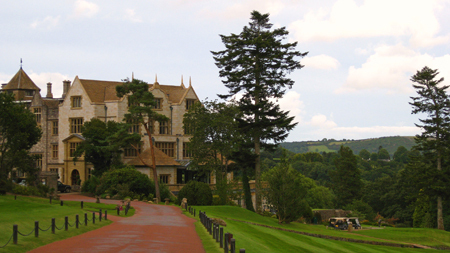 So on with the rain gear and proceed to Bovey Castle near Morton Hampstead on Dartmoor, our base for the weekend. 240 miles from Warr’s, door to door. We were staying in 3 self-contained Lodges, each sleeping 6. This proved ideal because we had a level of freedom to let our hair down that would not have been available had we been in the main part of the hotel. Awaiting our arrival was the hotel’s general manager and, throughout the weekend, nothing was too much trouble for him and his staff. We were received and treated like stars of the show and were the source of much friendly curiosity to staff and guests alike. Friday evening was a chance to bond as a group, so after a hot soak we convened in Lodge G3 for Rudi’s very fine jamon Iberico followed by heaps of spaghetti bolognaise, washed down with “modest” amounts of red (hic, slurp...). As the evening wore on, concern mounted for Buzz. Based on earlier progress reports, we had expected his ingress at around 20:00 but, unbeknown to us, his Zumo 550 was having a midlife crisis and definitely displaying symptoms, hot and cold flushes, that sort of thing. (I would get the 600, if I were you, mate.) After several rides straight past the entrance to Bovey Castle (Buzz, it’s the big thing with the large entrance sign saying “Bovey Castle”), he finally made it in time to do the washing up - we didn’t tell him that was what the staff were there for! Saturday morning necessarily had to be a leisurely start. Besides, it was wet but the delay factor was about to get worse. Remember Rudi’s puncture from the Vosges ride (1-5 July)? Well, when the devil vomits in your cereal bowl, he sticks a nail in someone’s tyre to let you know he’s been. The unlucky fellow was Paul but this time, we’re talking tubeless tyre. Enter Clive stage left with his “white sticky thingamijig” repair kit to the rescue. Bob’s your uncle, tyre pressure stable, we began the day’s ride and headed for Haytor, where it would have been rude not to support the local economy by buying an ice cream from the man, on account of the unseasonal balmy weather (global warming, my a**e!). Original plans for the morning had prescribed a series of rides meandering through the small hamlets on the Moor, such as Widecombe and the “Hansel and Gretel” picture postcard Buckland-in the Moor. However, the combination of the puncture-delayed start and the wet weather commended a judicious alteration to the plan. We pressed on to lunch in Tavistock on the other side of the Moor, not least because the horizon to the West promised better weather for the afternoon. More VIP treatment at the Bedford Hotel, where they had cordoned off a section of the carpark with traffic cones (I always knew they would someday have a useful purpose). Hungers abated and thirsts slaked, we were now ready to tackle the Moor properly. The weather had indeed brightened up, so we set off back towards Widecombe in the Moor, passing through Princetown where HM Prison, Dartmoor looms forbiddingly over the bleak countryside. From Widecombe, we began the tour route that had originally been planned for the morning. 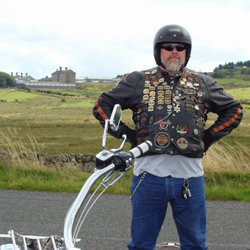 Although 13 bikes negotiating tight Dartmoor lanes was always going to be tricky, the afternoon proceeded without mishap, although being point man to the column had its hairy moments. The sweeping views were, well... sweeping... and on the long open stretches of road, only the presence of sheep on the verges and the occasional disgruntled cattle (Buzz, he’s looking at you) cautioned against giving it a bit of a tickle. Several stops at viewing spots allowed us to display our climbing skills, clambering over Tors like mountain goats in the rutting season. Not even the wailing from Michael’s faulty alarm wiring could disrupt the flow for long. Returning to Bovey Castle in the early evening, the manager had cleared a section of the main carpark at the hotel entrance, with the specific request that we park in line abreast, pride of place afforded to Chelsea & Fulham H.O.G.. As creatures of politeness, who were we not to oblige? Now, it being a Saturday in summer, Bovey Castle had hosted a couple of weddings while we had been out on the Moor. Some of us headed for the bar to catch a wee tipple before supper... but Del Boy and Buzz had other ideas. 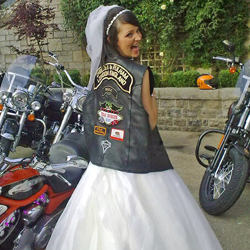 Having spied an innocent and unwary bride, new to matrimony and unschooled in the evil ways of men, they brazenly sought a resurrection of the ancient ritual of “droit de seigneur”, luring her with Buzz’s invitation, “Come, let me show you my V-Rod”. Fortunately for the young maiden, her precarious virtue was rescued by the timely arrival of her mother anxiously checking on her welfare. Buzz and Del Boy had to content themselves with a snapshot for their scrapbooks. Saturday evenings hedonism revolved around a barbeque in Lodge G1, with all food and equipment laid on by the Hotel. By this time, we had been joined by Marius, who had ridden down from London that afternoon, now making a full complement of 17. The role of head chef fell to Clive (well volunteered! ), ably supported by the ladies. Rarely has so much food been consumed with such gusto. Of course, proceedings would not have been complete without libation and many repeat ceremonies were performed through the evening in celebration of Del Boy’s newly acquired status as a Druid. Ritual chanting and singing of an ancient song titled “My Way” was accompanied by a communal game with its roots in archery, involving a 50 pence piece, clenched buttocks and a strategically placed target glass. Not easy on a full stomach in front of a baying mob. What a lot! It was now that the real advantage of being in the Lodges became apparent. To my considerable surprise given the night before, Sunday morning’s departure was on schedule at 09:00. We had 255 miles ahead of us back to central London. Our route took us through Newton Abbot to Teignmouth and along the coast to our first coffee stop at Budleigh Salterton. Information gleaned on the recce had revealed that the beach café opened at 11:00. We arrived at 10:57 - early would have been vulgar, on time did nicely. From Budleigh, we followed the coast heading for our lunch stop in Lyme Regis, which brings us to a lovely story. On the recce, Del Boy and I were wandering through Lyme Regis desperately looking for somewhere to park 15 bikes conveniently and safely. We were coming up with the square root of diddly squat when, as we meandered past the town’s watermill, a voice called out “Hello, you, I am one of your lot!” I turned round to see a man in a white coat gesticulating in my general direction. Naturally, not expecting the men in white coats to come for me just yet, I assumed the “you” he was referring to couldn’t possibly be me, so damn and blast the fellow’s impudence. Au contraire, dear readers, this turned out to be Justin Tunstall, an old time member of C&F H.O.G. who had moved down to the West Country to open a small shop by the watermill selling cheesy comestibles. Sight of the C&F chapter patches brought him hurriedly from his place of purveyance. Justin turned out to be our salvation. Not only was it nice to meet up with him but he offered to have a word with the mill owners and secure parking for us on the appointed day in an ideal spot in front of the watermill, safely tucked away. Justin also placed a short piece in the local rag advertising our trip, so when we arrived (again, exactly on time - well done everybody) there was much local interest. Lunch itself was just around the corner at a charming little healthfood restaurant - heck, after recent extravaganzas, we needed to do something healthy. 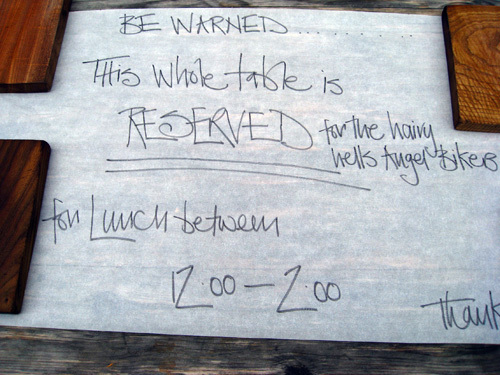 Since the weather was good, they had reserved a large outside table for us, giving the locals unambiguous notice that this table was RESERVED! Once off the ferry, we had intended to stop for coffee in Sandbanks but couldn’t find anywhere to park all the bikes, so pressed on in search of fuel. We finally stopped for a bite to eat and refreshments just the other side of the New Forest. From here, people began to make their separate ways home. My Odometer on the Zumo recorded 598.8 miles round trip from my home in central London and back. 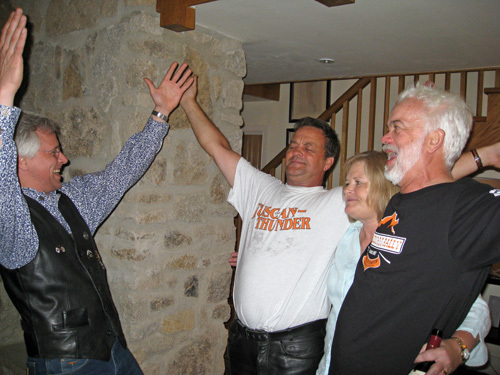 It had been another enjoyable ride with a great group of people who know how to party and have fun. 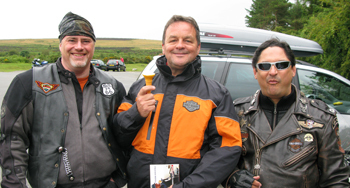 My thanks go to them and not least to Del Boy for all his help on the recce and for being such a good last man.